[시사뷰타임즈] 케이시 해서웨이라는 미국 나이로 3살, 한국 나이로 4알인 남자 아이가 부모와 같이 있다가 숲으로 걸어 들어가면서 바로 실종됐다. 케이시의 부모는 아무리 아이를 찾아도 없었고 곧 911에 신고를 한다. 케이시가 사라진 지역은 북 캐럴라이너 초코위너티 지역이며 숲이 빽빽하고 곰과 카욧(코요테)가 있는 곳이었다. 그리고 호수도 있다. 어리디 어린 케이시가 사라졌다는 소식에 자원봉사자 600여명이 케이시는 우리들의 아이다라면서 수색 작업에 동참했고 잠수요원들은 혹시 물에 빠져 잘못됐나 싶어 호수 속에 까지 들어갔었다. 구조/수색대원들을 이끈 것은 수색대장 쉐인 그라이어였는데, 3일간의 수색으로 그라이어는 기진맥진해 있었다. 그때 한 여자에게서 전화가 걸려왔다. 자기 집 근처에 있는 베어 넘어뜨려 수북히 쌓인 소나무 더미 밑에서 나오는 목소리를 들었다는 제보였다. 그라이어와 비상 수색대원은 제보받은 곳으로 차를 몰았는데 칠흙같이 어두운 밤이었고 그라이어와 비상 수색대원들은 타고간 차 보닛 위에 올라서서 귀를 기울였다. 그리고는 바로 케이시의 목소릴 들었다. 케이시는 “엄마 엄마”를 부르며 울고 있었다. 그라이어는 CNN에 “우린 65미터 가량 안으로 들어가서 케이시를 발견했는데 이 지역은 수풀이 빽빽이 우거진 곳이고 가시는 내 엄치손가락 만한 것들이 있었는데 케이시가 대체 어떻게 이곳으로 들어오게 된 건지 알 수가 없다”고 했다. 게이시는 무릎을 꿇고 상체를 앞으로 수그리고 있었으며 입고 있는 점퍼의 지퍼는 위로 다 채워져 있었다. 발견 전날에는 강우량이 50mm 정도였으며 거의 얼음이 얼만큼 추었다. 아이들이 보낸 이 편지는 곧바로 케이시가 있는 병실 옆에 놓여지게 됐는데 케이시는 부모에게 곰들이 여러 마리 있었는데 곰과 친구가 됐었고 곰들이 자기를 보호해주었다는 말을 했다. 그러나 수색 당국은 케이시가 실종돼 있는 동안 케이시가 봤다는 것은 아무 것도 없었다고 했다. Craven County, North Carolina (CNN) — "Momma, Momma." Chocowinity, North Carolina, EMS Capt. Shane Grier remembers hearing those words "clear as day." It was the voice of 3-year-old Casey Hathaway coming from the woods. The boy had been missing for 55 hours. Grier was exhausted. 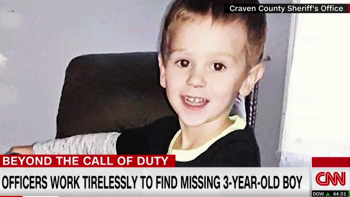 He had been working in shifts on the massive search for Casey who had wandered into the woods from his great-grandmother's North Carolina home. A woman had called in a tip that she heard a voice coming from a thick swath of pine trees near her home. Grier and another emergency responder drove to the location. It was pitch dark. They stood on the hoods of their cars and listened. That's when they heard the cries from Casey. "We got about 65 meters in," Grier told CNN this week, "we came upon him in a heavily vegetated area. The thorns were as big as my thumb. I don't know how he got in there." Grier said Casey was on his knees, hunched over, his coat zipped up. He was wet, cold. He had scratches on his face, but he was alive. After Casey went missing on January 22, many people had begun to fear the worst, including Craven County Sheriff Chip Hughes, who led the massive three-day search effort. "We started looking at the percentages of what are the chances a three-year-old, in this terrain, with wildlife like bears and coyotes, can survive this. The odds were against us," says Hughes. Hundreds of people looked for Casey, through the freezing cold and rain. Some members of law enforcement worked without pay because of the partial federal government shutdown at the time. In all, more than 600 volunteers contributed to the effort, believing "Casey belongs to all of us," says Hughes. Hughes says he will never forget the call when he learned Casey was OK.
"I looked at my wife and both of us teared up. She said, 'you guys did it.'" It was an emotional relief for Hughes, because he had made a promise to Casey's parents that he would never give up looking for their son. "When the rescue (vehicle) pulled up and I saw this 25-pound 3-year-old, with his big brown eyes open ... it was tear-jerking. This is when we made good on the promise." In a news conference, Casey's family said their son was doing well and "he wanted to watch Netflix." A boy who was lost in the woods says a bear kept him company. No one can prove it didn&#39;t happen. Related Article: A boy who was lost in the woods says a bear kept him company. No one can prove it didn't happen. Authorities say there's no telling what Casey saw during the time he was missing. News of his search and rescue made national headlines. Hughes received dozens of cards from school aged children, thanking him for "protecting them." Some of those cards now sit on his desk as a reminder of "why we do this job, because we don't always have good days," says Hughes. Meanwhile, Grier has a different reminder from the event he calls "a miracle." It's a picture of him next to Casey in a hospital bed. The Hathaway family gave it to him as a gift. It now has a permanent spot in his office. "I think everybody at some point in time was expecting a bad ending from this, and for the ending to be so good ... a little boy is home because of the efforts everybody did here," Grier said.